Discovery: Martin Klaproth 1789 (Germany); zircon mineral is mentioned in biblical texts. Word Origin: Named for the mineral zircon. Persian zargun: gold-like, which describes the color of the gemstone known as zircon, jargon, hyacinth, jacinth, or ligure. Isotopes: Natural zirconium consists of 5 isotopes; 28 additional isotopes have been characterized. The most common natural isotope is 90Zr, which accounts for 51.45 percent of the element. Of the radioisotopes, 93Zr has the longest half-life, which is 1.53x106 years. Properties: Zirconium is a lustrous grayish-white metal. The pure element is malleable and ductile, but the metal becomes hard and brittle when it contains impurities. Zirconium resists corrosion from acids, alkalis, water, and salt, but it does dissolve in hydrochloric or sulfuric aicd. Finely-divided metal may ignite spontaneously in air, especially at elevated temperatures, but the solid metal is relatively stable. Hafnium is found in zirconium ores and is difficult to separate from zirconium. Commercial-grade zirconium contains from 1% to 3% hafnium. Reactor-grade zirconium is essentially free of hafnium. Uses: Zircaloy(R) is an important alloy for nuclear applications. Zirconium has a low absorption cross section for neutrons, and is therefore used for nuclear energy applications, such as for cladding fuel elements. Zirconium is exceptionally resistant to corrosion by seawater and many common acids and alkalis, so it is used extensively by the chemical industry where corrosive agents are employed. Zirconium is used as an alloying agent in steel, a getter in vacuum tubes, and as a component in surgical appliances, photoflash bulbs, explosive primers, rayon spinnerets, lamp filaments, etc. Zirconium carbonate is used in poison ivy lotions to combine with urushiol. 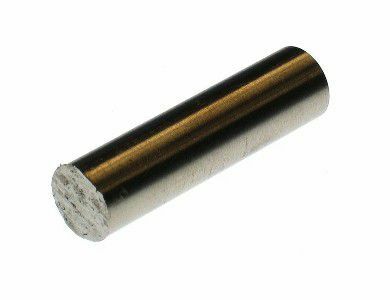 Zirconium alloyed with zinc becomes magnetic at temperatures below 35°K. Zirconium with niobium is used to make low temperature superconductive magnets. Zirconium oxide (zircon) has a high index of refraction and is used as a gemstone. The impure oxide, zirconia, is used for laboratory crucibles that will withstand heat shock, for furnace linings, and by the glass and ceramic industries as a refractory material. Occurrence: Zirconium does not exist as a free element, primarily due to its reactivity with water. The metal has a concentration of around 130 mg/kg in the Earth's crust and 0.026 μg/L in sea water. Zirconium is found in S-type stars, the Sun, and meteorites. Lunar rocks contain a zirconium oxide concentration comparable to that of terrestrial rocks. The primary commercial source of zirconium is the silicate mineral zircon (ZrSiO4), which occurs in Brazil, Australia, Russia, South Africa, India, the United States, and in smaller amounts elsewhere in the world. Health Effects: The average human body contains about 250 milligrams of zirconium, but the element serves no known biological function. Dietary sources of zirconium include whole wheat, brown rice, spinach, eggs, and beef. Zirconium is found in antiperspirants and water purification systems. Its use as a carbonate to treat poison ivy has been discontinued because some people experienced skin reactions. While zirconium exposure is generally considered safe, exposure to the metal powder can cause skin irritation. The element is not considered to be either genotoxic or carcinogenic. Crystal Structure: Zirconium has an alpha phase and a beta phase. At room temperature, the atoms form close-packed hexagonal α-Zr. At 863 °C, the structure transitions to body-centered β-Zr. Emsley, John (2001). Nature's Building Blocks. Oxford: Oxford University Press. pp. 506–510. ISBN 0-19-850341-5. Lide, David R., ed. (2007–2008). "Zirconium". CRC Handbook of Chemistry and Physics. 4. New York: CRC Press. p. 42. ISBN 978-0-8493-0488-0.